I went to Tsukiji at workday’s lunchtime the other day. After all, I went to Choseian. Truthfully speaking, at first, I went to Kashigashira that is the farthest lunch place that I can go from my office. But there were some people waiting in front of the restaurant. I gave up soon and I went toward Totoya that is famous as Yakitori bowl, but on my way to Totoya, I stopped in front of Choseian. I looked inside the restaurant out of the door. Fortunately there was one vacant table ! It was too muggy and my brain didn’t work well, so I ordered a “Cold soba with Karami-daikon radish” that is to be noticed beside the entrance. Choseian have only some tables for 4 persons. So basically, we have to share a table. Of course I realize that. But, there’s some people who make me feel unpleasant…. I hate share the table with them. At first, such a man entered the restaurant and tried to sit in front of me though the waiter tried to take him to the back table. Ooooops ! No ! NO !!! I thought so. But the waiter said him to move to the back table again and again and after all he moved to there. 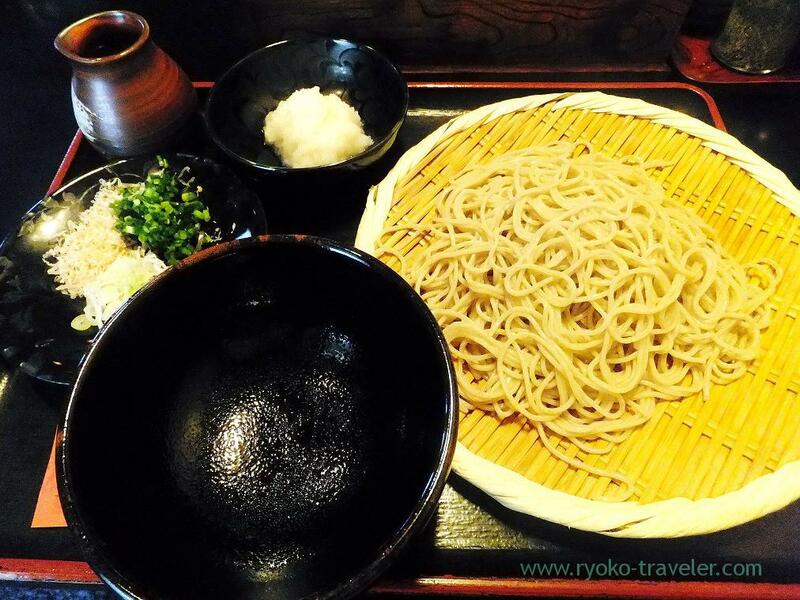 After a while, my soba with karami-daikon radish (辛味大根の付けおろしそば, 880 yen) came. The white thing at that side is grated karami-daikon radish. Karami-daikon is a kind of pungent daikon radish. It had slight bitterness and pungent taste. Fresh and light pungent taste. It was still hot at daytime and such a food make me feel fresh. I put the soup and grated karami-daikon radish into the bowl on this side. Well, it was splendid ! It had fresh and simple taste. I remember that I ate soba in warm soup at Choseian before and I didn’t like it because it was overcooked. There is no need to be unnecessarily anxious about the cold soba and I could enjoy the strong texture of the soba. 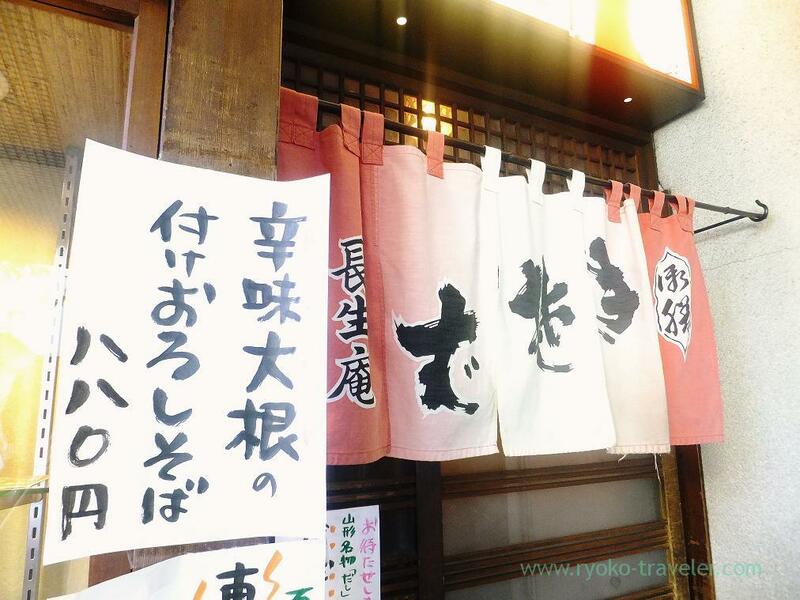 I was satisfied with the soba and got out of the restaurant for going back to my office. Well, this set don’t have much soba and ingredients are only grated daikon and green onions. In addition, daikon helps digestion ! When I got to my office, I felt very hungry ! Nevertheless I had just finished eating soba ! The soba made me feel happy, but it didn’t fill my stomach. 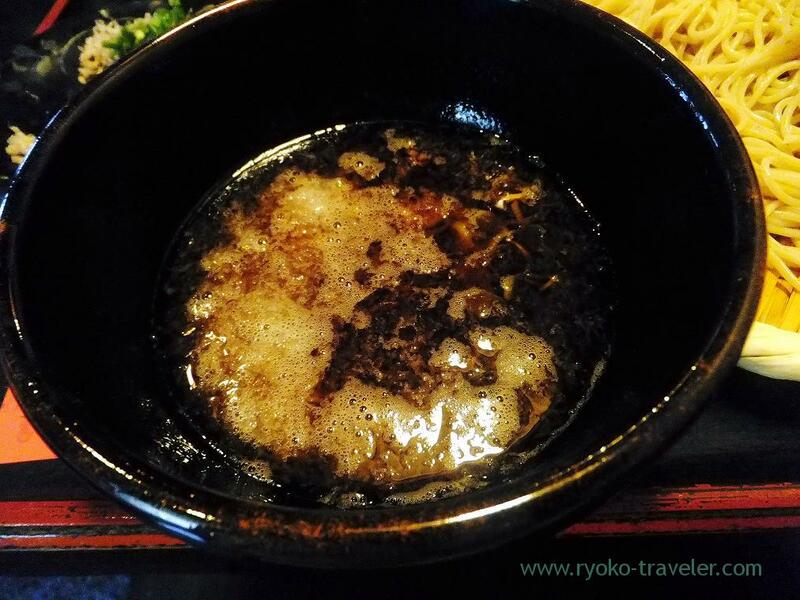 I should have eaten tempura soba or any filling foods… !